Mother's Day is a very special day and this beautiful and elegant design celebrates all the mothers out there. 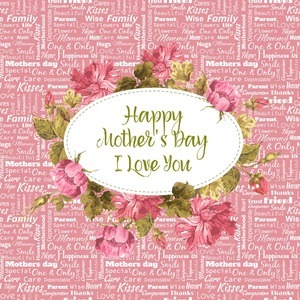 It has a stunning pink Mom / Mother Word Cloud background, with an incredibly gorgeous floral label. It is feminine, soft and strong just like our mothers. We chose pink because it is feminine, however, if your mom is not a pink gal, then change to any one of the 100's of colors in our system. We simply love the the floral label - we think it is stunning, however, if you mom prefers simple - then select a simple label - we have many different label styles for you to choose from. We chose "Happy Mother's Day. I love you" for our sentiment and personalization. Choose your own sentiment and personalize this in any way that suits you. Change the text, the font, the color. Best of all - you get to see all your change right there on the spot in our rendering system.